I’m a visionary person. When an idea pops into my head, I see it. And that doesn’t just pertain to food, it can be anything. An outfit, how I want to decorate our apartment, planning a dinner party, table settings, anything…. I don’t just get an idea, I get a vision. Consider it a super power. That’s mainly why I’m so excited to share today’s post with you. This was a Valentine’s Day inspired vision that randomly came to me while my husband and I were in the middle of packing up our apartment, preparing to move and I was distracted with blog recipe ideas. Lo and behold these pretty pink little heart cakelets popped right into my mind. They started as a vision and now here they are in real life. Aren’t they pretty!! I wanted these little cakelets to be as easy as possible. 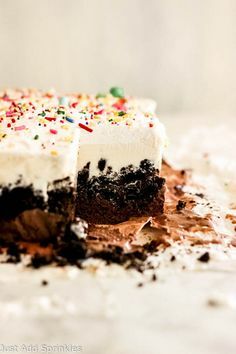 This recipe requires a boxed cake mix, a few other ingredients to elevate the cake mix, a tiny amount of strawberry extract/emulsion (I found this kind at Michaels) and of course, sprinkles. Don’t forget the sprinkles. You need a heart shaped cookie cutter. The one I used this one, it’s a small 2.75 inch and I was able to get 12 cakelets from the sheet of cake. The cake needs to be completely cooled before you cut out your heart shapes. The strawberry emulsion is already dyed red, and it has a string taste so a little bit goes a long way. I only used 1/2 teaspoon and was very happy with the flavor and hue of pink I got from it. Remember, less is more and you can always add more if you feel it’s necessary. Happy (early) Valentine’s Day, Friends! Preheat your oven to 350 degrees. Spray a 9×13 inch rimmed baking sheet with baking spray and line with parchment paper, set aside. In a large bowl combine all the ingredients, except for the sprinkles. Mix the ingredients together on medium speed using a handheld mixer (or stand mixer) until cake batter forms, scrape down the sides of the bowl as necessary. Batter will be thick. Fold in the sprinkles. Pour batter into the baking sheet and spread it out evenly. Bake for 25-30 minutes, or until a toothpick inserted in the center comes out clean. Allow the cake to cool completely, this may take a few hours. 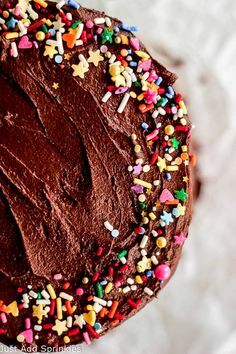 Remove cake from baking sheet by lifting it up with the parchment paper and lay on a flat surface. Use the heart shaped cookie cutter to punch out the cakelets. The cake will be thick so you may need to push the cookie cutter through the cake completely to get a clean cut heart shape. Pull excess cake around the cutter if need too. You can either discard the cake scrapes or reserve some to sprinkle on top of the cakelets. Make cutouts as close together as possible to get the most out of the cake, similar to cutting out sugar cookies. I was able to get 12 cakelets out of the cake. Make the strawberry glaze: In a bowl combine all the ingredients for the glaze and whisk together until thoroughly combined and smooth. Glaze will be thick. You may need to add a few more tablespoons of heavy cream in you prefer a thinner, pour-able consistency. Spoon glaze over the top of the cakelets and garnish with sprinkles. 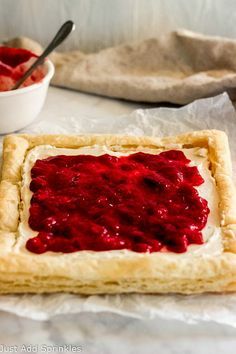 * 4 tablespoons of heavy cream is enough for the glaze to form but it’ll be thick, if you want a little thinner consistency you may need to add a little more until you reach the desired consistency you’re looking for. Your Funfetti Hearts will make a very special Valentine treat! Hope you are having a good week and staying warm. Thanks so much for sharing with us at Full Plate Thursday! Thanks for stopping by my little spot Miz Helen! I always love seeing what’s going on over at Full Plate Thursday! These would not last 10 minutes in my house! Adorable and they look delicious! Thanks for linking up to Best of the Weekend! You were one of my features this week! Enjoy your weekend! Looking forward to the next link up to see what others are sharing!